Why is it that when I see a table of pastries, beautiful pastries, small cookie type pastries, exquisite layered cakes and various fruit platters on a table set for an Afternoon Coffee or Tea….…I immediately zero in on that small bowl of chocolate truffles….do you do the same? I have not heard anyone else call them that name, nor do I know anyone who makes them, but it certainly was and still is one of my most favorite “little bites” during a holiday season. Use a flat plate, and place the 4 chocolate squares on it, and microwave them at a high temperature set at 30 seconds. Repeat this process until the chocolate squares are melted, it usually takes about 3 to 4 times with rotating the plate each time. With a small spatula flatten the melted chocolate on the plate and cool it till it comes to room temperature. Beat the egg whites in a small bowl until just foamy, and set aside. Into a large bowl measure the 4 cups of nut meal, add the sugar, and mix them together. Add the melted chocolate and the foamy egg whites and mix again gently. Now add the Rum and bring the mass into a thick pliable mass, thick enough to roll into little balls. It is good to let it rest for about ½ hour at room temperature for the flavors to blend. 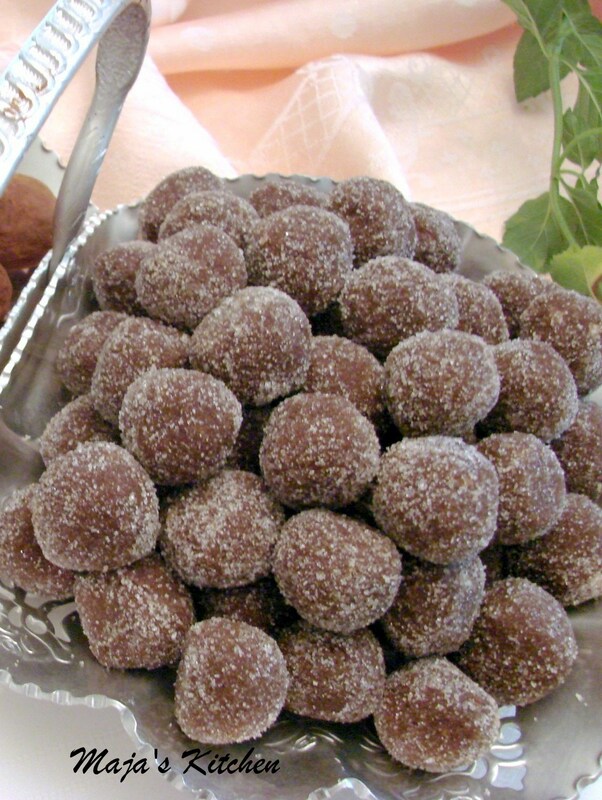 Roll this mixture into small balls, about ¾ inch in size, and coat them in crystallized sugar. Place them onto a tray to dry over night at room temperature, and cover them with wax paper for another day. To store them place them in an airtight container and keep them refrigerated….do not freeze them….they will keep refrigerated for 3 to 4 months or longer……unless you eat them sooner…. This is another favorite of mine…and I always thought that to make them is very difficult. I admired people who would tell me that they just whipped up some truffles late the night before. I was so impressed! You see this was before I attended classes at culinary schools and became a cooking teacher. I like to use bittersweet chocolate that contains 60% Cocoa, but I have made them with semisweet chocolate and milk chocolate as well. They all come out just as well since it is one of the simplest recipes that one can imagine. 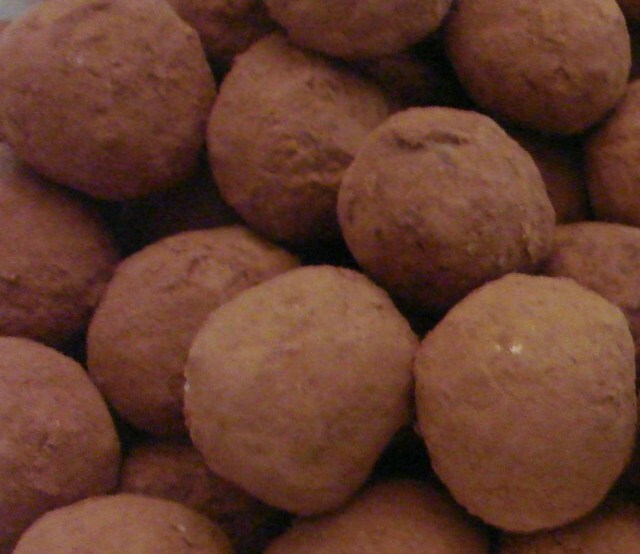 To make truffles is not magical even though the results are……. All you need is 2 lbs of chocolate and 1 cup of heavy cream…. Cointreau, and some cacao powder, preferably Dutch Processed…. Four ingredients…..that is all. 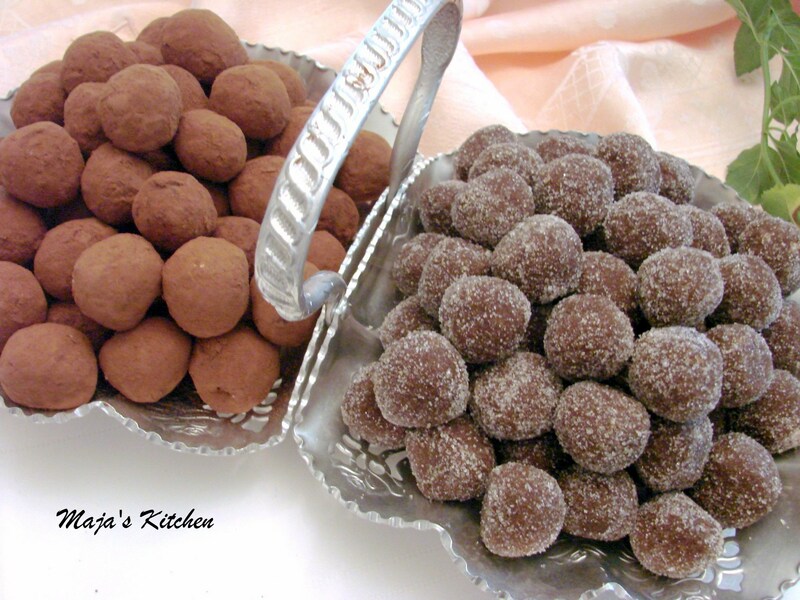 In essence you are making a “ganache” that will turn into truffles when cooled. Place the chocolate pieces into a microwavable glass bowl and add the cup of HEAVY cream. Place these ingredients into the microwave set at HIGH and heat for 1 minute. The chocolate will have started to melt. Mix it gently with a metal spoon and if not quite melted….. and this is the most difficult part in the process of making truffles ….put it back into the microwave and heat it again but, only for 10 seconds, take it out and gently mix it again. If it’s still not completely melted heat it again only for 10 seconds, mix it again gently and incorporate the cream into the melted chocolate. If you still see pieces in the melted chocolate it goes back into the microwave for another 10 seconds. At this time it should have melted all the chocolate pieces. Now keep stirring the ganache… until it is very smooth and glossy. Place the bowl of ganache… with the spoon that you stirred it with… into the refrigerator for about 15 to 20 minutes. Mix it again. The sides on the bowl will obviously cool quickest, scrape the hardened chocolate off the sides and mix it back into the still softened ganache. Repeat the process of cooling the ganache in the refrigerator until it becomes a heavy creamy mass. Then use an electric hand mixer whip the chocolate ganache until the color changes just slightly….it will look slightly lighter in color and with that you are just about to the fun part of making the chocolate truffles. The only thing that is left is to roll them into little balls – about ¾ to 1 inch in diameter and coating them in cocoa powder. Place them onto a cookie sheet and place a wax paper over them. Leave them sitting in a cool place at room temperature over night. To store them place them into an airtight container and refrigerate them…..so not freeze them. They would last for three to four month or longer if you have not enjoyed them sooner. 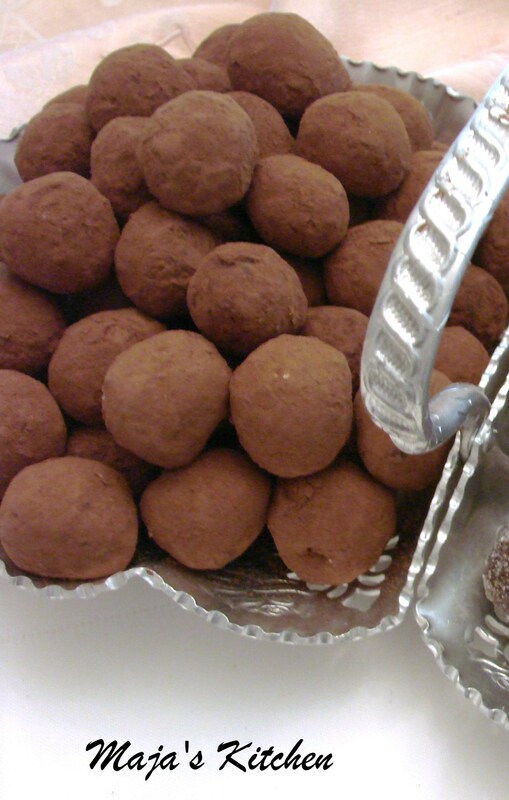 Do you have a favorite truffle and how do you make them….? When you make the truffles from the above recipes and have any questions…please, let me know and I will gladly answer them and help along…because, I would love to see you storing them in your refrigerators to have on hand when you feel you want to surprise someone special…..
You may share my blog ….. http://www.majaskitchen.com ….with your friends! Wishing everyone a most Happy Truffle Day!